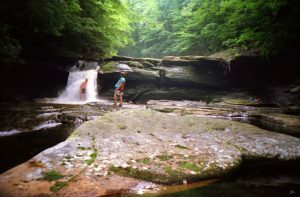 West Virginia’s Otter Creek Wilderness sits between Shavers Mountain and McGowan Mountain. Otter Creeks forms a valley and this is where most of the wilderness area is located. The wilderness area has 42 miles of hiking trails. The longest trail is Otter Creek Trail which is 11 miles. The original wilderness area was 20,000 acres and was designated in 1917 when the U.S. Forest Service purchased the land as part of the national forest system. Another 698 acres of land were added to the Otter Creek Wilderness in 2009 by the Omnibus Public Lands Management Act. The Otter Creek Boom and Lumber Company heavily logged the area from 1897 to 1914. Even after the designation, the area was again logged from 1968 to 1972 before it was officially named a wilderness area. This wilderness area is home to one of West Virginia’s largest black bear populations. Hikers must keep a cautious eye out for these beautiful, but potentially dangerous animals. This is a truly remote backcountry hiking or camping experience. When in doubt, you might want to try the West Coast like in California. There are pristine areas for campers, hikers, cross-country skiers, and hunters to find recreation and enjoy the beauty of nature. There are also 45 miles of rugged, unmarked remote trails. Most of these trails meander along the creek. here are also timber rattlers which means hikers should be very careful when stepping into the tall grass. Camping is allowed along the banks of Otter Creek and the area is popular with visitors who enjoy the chutes, waterfalls, and pools. Waterfalls range from three feet to ten feet high. There are also swirling rapids and tranquil pools. The camp site is first come-first served and is large for two tents. There is a second camp site a bit down the creek. The area often gets rain and in the winter, several feet of snow. There is a possibility of frost, even in the summer, so campers and hikers should dress appropriately.